I'm an obsessive Thanksgiving cook. There, I said it. It's part pain and part pleasure, but even with the agony that can at times come with preparing this annual feast, at least it all has a purpose_ family togetherness and full bellies! I'm also an obsessive Thanksgiving eater -- it doesn't have to be the fourth Thursday in November for me either. Frequently in the middle of summer I will go to a local diner for their Thanksgiving platter. That's how much I love this meal. So, when it comes to the actual day that I'm going to prepare it at home for my whole family, I tend to go a little overboard and make two of everything_ two brined turkeys, two dishes of mashed potatoes, two gravy boats....you get the drift. Without fail I always end up with enough left over to feed an army. The past few years I've made Potato Turkey Balls and Brazilian Turkey Casserole with the leftovers, which were both big hits with the troops, but this year I'm making Turkey Shepherd's Pie. My Aunt made a mean Shepherd's Pie when I was a kid and my family always looked forward to it at our regular Sunday night dinners, so the idea of marrying Shepherd's Pie with Thanksgiving dinner seemed like a no-brainer to me. After cooking for days on end and needing (and truly deserving) a break, you have to try this delectable dish that perfectly puts to use all of your holiday leftovers! See below for more ways to use those Thanksgiving leftovers! 2. Heat 1 tbsp of butter in a saucepan over medium heat and cook the onions for 4 minutes or until translucent. 3. Add the celery, carrots and thyme and cook for an additional 3 minutes. 4. Melt the remaining 3 tbsp of butter into the vegetables and sprinkle 3 tbsp of flour over them. Stir to make a roux. Cook for 1-2 minutes, stirring to coat the vegetables. 5. Add the milk, broth, chopped turkey and peas and simmer over low to medium heat for 10 minutes or until thick and creamy. Add salt to taste. 7. 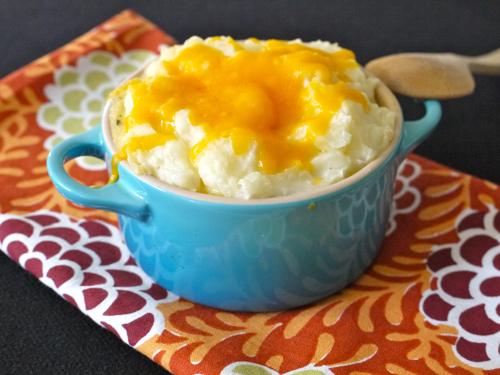 Evenly top each filled ramekin with mashed potatoes and sprinkle 2 tbsp of cheddar cheese on top to cover. 8. Place ramekins on a baking sheet and bake for 10 minutes until warmed through and cheese has melted (25 minutes for an 8 x 8 inch dish). * Cover and freeze after this step. Defrost and bake as directed in step 7. I think you maybe forgot something... ;) \"(LINK “ROUX” TO WIKI PAGE)\"
Yes, I love how you've left your notes in this one. Obviously VERY busy prepping for the holiday weekend! Happy (American) Thanksgiving. A friend just made it by adding a layer of sweet potatoes/yams before she added the mashed potatoes on top...delicious! How would you make this without using dairy products? I haven't made this particular recipe from Weelicious, but I make vegan Shepherd's pies and pot pies frequently. Just replace the dairy milk with your favorite alternative milk-I always use unsweetened regular almond milk. Instead of butter, sub one of the many available butter alternatives (I like Earth Balance). For the cheese, omit entirely, or use a non-dairy cheese, such as soy or almond cheese. To make vegan, you can replace the meat broth with veggie broth, and change the turkey for a root veggie (like sweet potato or turnip) or a soy meat alternative. My kids love this type of casserole and as per Catherine's instructions, if you make it in a ramekin, it is even more appealing to the kids; just the right size for them. Just made this for dinner and it was a hit with the whole family. Looking forward to making it again. Another hit for the whole family. I always tweak recipes a bit, and I did half cauliflower and half potatoes then left off the cheese. Definitely making this again! I made some slight modifications. Didn't have celery and added corn and used ground turkey. My 2 yr. old ate twice as much as me and my husband. He ate the same size serving as us, then proceeded to eat my entire portion. I don't blame him. It was delicious! Needless to say, we are putting this into heavy rotation.